Tales of Vesperia is one of the better games in the Tales of series. It’s also one of the few iterations I wouldn’t have expected to get a remaster. Tales of Vesperia first launched over a decade ago and has always been viewed as one of the better Tales of games. That status was only magnified by the fact that it was followed by a series of hit-or-miss annual installments that disappointed more often than they enthralled, helping to build up the retrospective status of Vesperia. When the game was re-released on the PS3, developer Bandai Namco included new characters, plot points, and more. That version never even made it to the west, disappointing fans of the game and making it very clear at the time that there wasn’t much interest in capitalizing on Vesperia‘s growing reputation within the franchise. All of that context makes the release of Tales of Vesperia: Definitive Edition something of a minor miracle. What’s even more divine is the game itself, which has aged like a fine wine. Between a warm, cozy return to a vibrant game world and all of the additional content that fans in the west are only receiving now, Tales of Vesperia: Definitive Edition lives up to its billing and is well worth a first-time or return visit. Tales of Vesperia: Definitive Edition contains one of my favorite JRPG narratives, and it doesn’t appear any worse after being exposed to over a decade’s worth of genre tropes and similarities. It’s weird, because the game definitely leans into a lot of those tropes itself, but it tries to alter them in subtle ways. For the most part, it succeeds, and what we are left with is a cast and crew that gradually grows in dynamic ways. Watching Yuri grow into a local legend as he struggles to reconcile with his past is endearing, and the characters that surround him react to it in different ways. Past transgressions aren’t dismissed just because the game needs to move on. Yuri’s past life as a criminal rears its head more than once, and characters will judge him for it. It feels natural and intriguing rather than just a way to pad out the protagonists back story on the way to forgiveness. The storyline itself is kind of standard JRPG fare and tends to drag on in the same way that many games in this genre do—by hour thirty, it feels like the story is progressing a little slowly. For the most part, though, it is a serviceable and sometimes-inspired take on a redemption narrative that hits the mark on its most important beats with only a few stumbles in between. Again, the characters themselves step up in these moments to make the game fun. The relationship between Estelle and Rita, which is fleshed out more in Tales of Vesperia: Definitive Edition, develops organically and always helps support the slower moments in the global story. Watching them become friends, and what many fans believe is eventually something more, is a reminder that all members of the party are fighting for something. That might not seem like much, but motivation can be glossed over with ensemble casts like the one in this game, and thankfully that rarely happens. 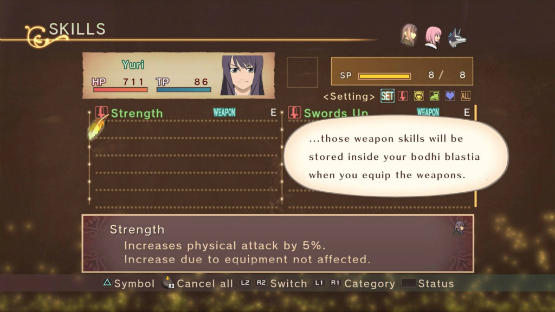 By contrast, the combat in Tales of Vesperia: Definitive Edition is relatively shallow. It’s a less ambitious take on the action-JRPG formula than we see later in the franchise, but that isn’t necessarily a bad thing. There’s still a lot do within the constraints of that system, and it changes over the course of the game. While the first act is typically about TP (the game’s mana system) management, later acts are about developing combos that exploit enemy movement and attack patterns. It’s also just fun. Smacking around a bunch of enemies by using some overpowered ability combinations might get old eventually, but over the course of my first play through, it didn’t really happen. The game’s AI is actually impressive so many years removed from its inception. Party members do tend to spam their TP-based attacks a little too often but that can be managed, and every character puts in a request for item use that can be cancelled before they use it, which helps manage player inventory. None of that is groundbreaking these days, but it helps an enjoyable journey dodge some of the most common and frustrating pitfalls older games can face. Tales of Vesperia: Definitive Edition is a remarkable game. Years later, its skill system and equipment-based ability learning still feels engaging. The game’s music is wonderful, its cutscenes are well-animated, and the in-party banter remains a draw rather than an annoyance. The game’s art direction is also done in such a way that it feels virtually immune to the inexorable march of time. The game looks absolutely great on a PS4 Pro, and there’s no noticeable slowdown or frame rate issues in the remaster whatsoever. Bandai Namco certainly did a thorough job in making sure the game ported onto the PS4 Pro flawlessly. With that said, though, there is one major issue. 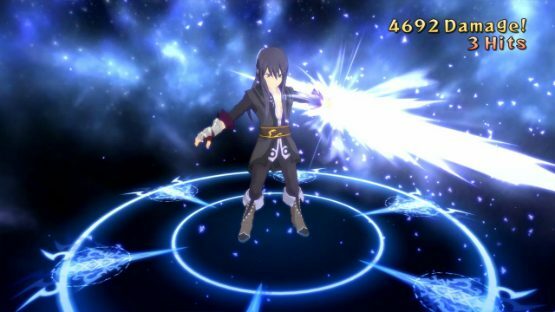 Because the additional content featured in Tales of Vesperia: Definitive Edition never made it to the west in its PS3 release, the English-voiced versions of those additions now feature some different voice actors. It’s not enough to make the experience actively bad, but it is noticeable enough that it can be extremely jarring. The worst instances of it are whenever characters are using additional content within the context of combat, because they’ll flip back and forth between different voices in a way that makes it impossible not to compare the two. To be honest, it was enough to make me want to switch back to Japanese audio, which is thankfully an option when you begin the game. I’d recommend it, even though the English voice-acting for the game was actually quite good, just because of how distracting these switches in character audio can be. 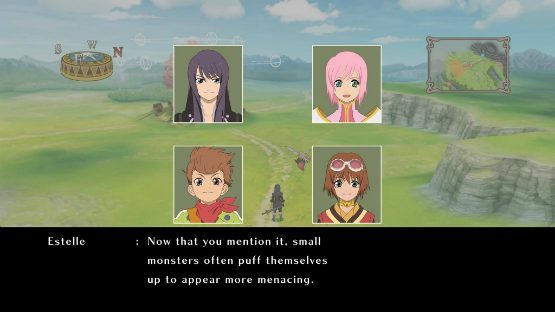 Ultimately, the question for many will be if Tales of Vesperia: Definitive Edition is worth picking up even if players have experienced it before. The answer, at least in my eyes, is a resounding yes. The addition of characters and story content makes it a fresh experience for western fans, and it is a game that still manages to capture the imagination even now. Audio issues aside, this is the best version of Tales of Vesperia we’ve ever gotten—and, to be frank, that we will ever get—and newcomers and veterans alike owe it to themselves to experience the Definitive Edition of one of the best Tales of games ever created. Tales of Vesperia: Definitive Edition review code provided by publisher. Version 1.01 reviewed on a PlayStation 4 Pro. For more information on scoring, please see our Review Policy.